After two consecutive seasons of missing the playoffs, the Nashville Predators are back in. Not only have the Predators clinched a spot, but they also control their own destiny for the Central Division title with the St. Louis Blues and Chicago Blackhawks breathing down their necks. To not win the Central would mean playing either of those teams (most likely), so clinching the division is extremely important. Of course, in clinching the division, the first round opponent would (most likely) be against the red hot Minnesota Wild. With just three games remaining in the regular season, Nashville is in an unfortunate situation where neither of the potential first round opponents are favorable. A first round meeting between Nashville and Chicago would need no hype. The Chicago media has ripped the Predators’ organization for their playoff ticket policy in efforts to “keep the red out.” If anyone has been to Bridgestone Arena when the Blackhawks come to town, half the building is red. It is almost a home game for the away team. Though the new ticket policy should reduce the amount of Chicago natives that appear inside the confines of 501 Broadway, it will not eliminate them. Knowing there is sure to be off-ice drama, a possible series between the two makes it that much more exciting. SportsClubStats.com has the likelihood of these teams facing off in the first round at 38.1%. 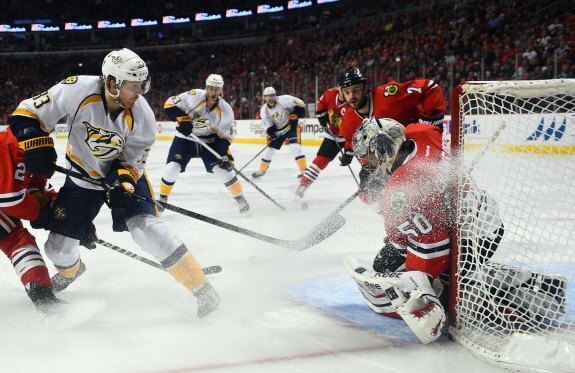 Chicago won the regular season series against Nashville with a 3-1-0 record in four meetings. The Predators’ lone win against the Blackhawks came when Antti Raanta, who is currently playing in the American Hockey League, was between the pipes. These teams have not met since December 29. A positive for Nashville is Chicago will be without Patrick Kane, their second-leading scorer, in the first round, barring a miracle recovery. Kane, who underwent clavicle surgery in late February, is on a three-month recovery program and is expected to miss another six weeks. Though they have many other go-to weapons, a Kane-less Blackhawks is not a terrible first round opponent, given Nashville’s other options. The only way for Nashville to not play Minnesota, given the Predators clinch the Central Division, and the Wild win the top wild card spot, is if Nashville also secures the top seed in the Western Conference. The Predators are three points behind Anaheim with a game in hand. Jumping the Ducks would open the Predators to potential first round opponents of the Calgary Flames, Los Angeles Kings or Winnipeg Jets. However, that is an unlikely scenario with Nashville being winless in their last three games. SportsClubStats.com has a match-up with Minnesota at a 28.2% likelihood. Wild goaltender Devan Dubnyk has put the team on his back since being acquired via trade from the Arizona Coyotes halfway through the season. Prior to Dubnyk’s first start with the Wild on January 15, Minnesota was eight points out of a wild card spot. 37 consecutive starts, a 26-7-2 record, 1.74 goals against average and a .937 save percentage later, Dubynk and the Wild are now sitting in a comfortable playoff position. Though 37 straight starts is an impressive stat for Dubnyk, it is also concerning. By playoff time, he may not have much gas left in the tank. Nashville and Minnesota have split their regular season series thus far but have a fifth and final meeting on April 9 in the Music City. Since Dubnyk has joined the Wild, the Predators have been unable to defeat them, losing 4-2 on February 26 and 3-2 in overtime on March 17. A Nashville loss in the final regular season clash would make Minnesota clear favorites if the two played in the first round. For Nashville to play St. Louis, Chicago would have to win the division. SportsClubStats.com has this possible first round series at a 21.8% likelihood. On paper, there is not a stronger team than the Blues. They have scoring, defensive depth and sufficient goaltending, all key components for a deep run in the playoffs. Though the Blues are arguably the stronger of the three teams, the Predators match up well against them. Nashville won the season series with a 3-1-1 record but haven’t played each other since January 29. What would make this series entertaining is young forwards Vladimir Tarasenko and Filip Forsberg trying to one-up each other. Tarasenko has 71 points (36 goals, 35 assists) compared to Forsberg’s 61 points (24 g, 37 a). While watching the Predators, do keep track of other games in the Western Conference that can affect Nashville’s seeding in the standings. Chicago and St. Louis play each other twice before the regular season ends on Sunday, March 5 and Thursday, March 9.